If you've got the space at your next BBQ, the Boxman is a swanky alternative to the plebeian tent or—gag!—lowly picnic table. 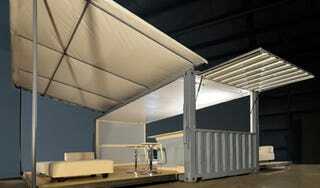 Made from a converted shipping container, you're guaranteed to make your friends and neighbors feel inadequate. The Boxman can be delivered directly to your next shindig, and requires only 20 minutes of setup. Once it's unfolded and switched on, you'll have a 500 square foot party venue that is possibly nicer than your actual home: bamboo floors, bar seating for six, and marble countertops—powered entirely by sunlight. Just make sure you wrap things up before sundown, because everything abruptly shutting off could kind of kill the mood.